Our skûtsje was built in 1908 by the Wildschut Brothers shipyard in Gaastmeer, a small village in southwestern Friesland. The barge had been commissioned by Age Vaandriks of the nearby village of Koudum, and on 20 March 1909 it was measured and entered into the ledgers in Sneek as De Nieuwe Zorg, registration number S831N. Her length was listed as 16.33 metres, her beam as 3.43 metres and she was calculated at 31.064 tons. De Nieuwe Zorg means The New Concern or The New Worry, which was a common name for skûtsjes at the time; between 1895 and 1923 there were nearly four dozen skûtsjes commissioned as Nieuwe Zorg, De Nieuwe Zorg or Nieuwe Zorgen. The next thing we have been able to trace about her is from an online transcription of data from the registry ledgers. She was re-measured on 25 June 1941 and her new data were entered Into the ledger: length 16.38 metres, beam 3.44 metres and tonnage 31.971. Her new registration number was G6496N, and her new owner was Douwe Albert Visser of Stavoren. We tried to trace Douwe Albert Visser, but we kept coming up with modern versions of the name. Our online searches were seriously affected by there currently being an Albert Visser and two Douwe Vissers as very competitive skûtsje racers, each as skipper of one of the fourteen competing skûtsjes in the annual SKS championship series. In August 2013 Douwe Visser, Jzn. skippered his crew in the De Sneker Pan to his third consecutive championship in the fourteen-day, eleven-race series. This was his eighth championship since taking-over as skipper in 1989. Complicating our search further is the fact that a Douwe Visser, Azn. is also an SKS skipper, and he won the series championship twice, 2005 and 2009 in the skûtsje, Doarp Grou. In 2011, 2012 and 2013 he was runner-up to his cousin Douwe. Further confusing search engines is that Albert Visser, Jzn, brother of the Sneker Pan’s skipper, had for years been the skipper of Twee Gebroeders, the SKS skûtsje from Drachten, and in 2013 he moved to take over as skipper of the Lemster skûtsje. With all the notable skûtsje involvement of these modern Douwe and Albert Vissers, Google couldn’t get us back beyond very recent history. 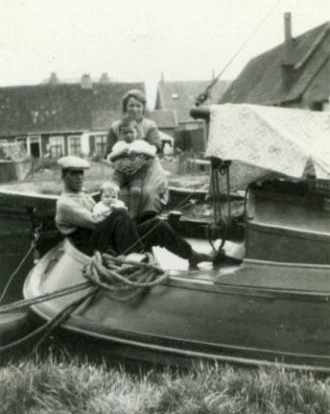 We found a photograph of Douwe Visser and his wife Tjitske Salverda posing at the tiller of Nieuwe Zorg with their first two sons Albert and Taeke in 1931. From this, we can assume that they had bought the skûtsje in 1931 or earlier. Further communications confirmed that Douwe was grandfather or great uncle to more than a third of the skippers of the current SKS fleet. The family members have won the SKS championship seventeen times since 1945, when the organization was established. The next piece of information we have is an undated entry in the final column of the original registration ledger, next to the 1941 entry. This indicates that the registration was cancelled. This cancellation presumably happened when she was converted to a houseboat, but we have not been able to determine when that might have been. 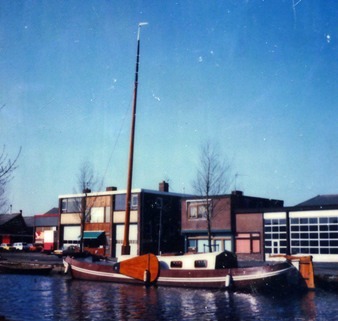 We do have a photo of Nieuwe Zorg taken in 1975 showing her as a rather ugly houseboat. We have a simple bill of sale dated 03 September 1975 showing Henk van der Zon of Hoofddorp bought Nieuwe Zorg from T. Olderhage of Lisse for Fl 15,000, which was about CA$10,000 at the time. Henk was a professional welder and between 1975 and 1977 he and his wife Madij restored and converted the skûtsje to a jachtenroef. Henk told us that for the design of the beautifully curved roef, he had used the design of the Groene Draeck, the Lemsteraak that the people of the Netherlands had given to Princess Beatrix, their future Queen on her eighteenth birthday in 1956. We have a photo dated 1977 showing Nieuwe Zorg restored to sail and looking rather yacht-like. Henk and Madij then enjoyed and maintained Nieuwe Zorg for thirty-seven years, until we purchased her from them in the summer of 2012. Beginning in 1857, four generations of the Wildschut family ran a ship yard in Gaastmeer. 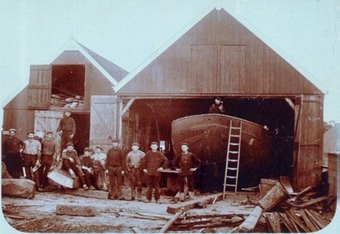 Initially their business was repairing and maintaining ships and boats, though they soon began building wooden fishing boats, particularly Staverse jollen, pramen and schouwen. They also began building wooden cargo tjalken, and as the demand grew for lighter and more nimble tjalken, they participated in the development of the wooden predecessor of the skûtsje. Around 1900, with the yard run by four Wildschut brothers, it began building with riveted iron, particularly tjalken and klippers with displacements of up to 170 tons. Business was booming and there were as many as thirty workers employed in the yard. The demand for nimble iron roefschepen increased, and in the decade leading up to The Great War, the Wildschut brothers built eighteen iron and steel skûtsjes. The sharp rise in steel prices at the beginning of the war, the slowing of trade resulting from the Allied naval blockade, the decline of the fishery on the Zuiderzee and the increasing use of land freight transportation, all conspired to bring a quick drop in the demand for new ships. The company built only two skûtsjes during the war. This slow business during the war, complicated by a family dispute, brought their ship building ventures to an end, though one of the brothers continued building small pleasure craft until 1953. The world-wide depression starting in 1929 decreased the commercial usefulness of the skûtsje and the closing of the Zuiderzee in 1932 sounded its death knell. There were only four skûtsjes built in all of Friesland after 1928, and with the last one in 1933, their production ceased. During the ensuing years, many skûtsjes were fitted with engines, but even with power, they were too small to compete with new designs, particularly the luxemotor. 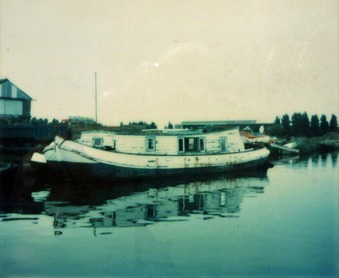 By the end of World War II, like most tjalk type barges, skûtsjes were commercially obsolete, and were either abandoned, were sold for scrap or were refitted as houseboats. Some skûtskes were converted to sailing yachts, retaining the mast and rigging, removing the small roef aft to make a cockpit and turning the cargo hold into living accommodation with a jachtenroef. Our skûtsje is one of these. A few were maintained in their original form and used in the annual inter-town skûtsje races. As the popularity of these races grew, more and more houseboat and yacht conversions were reverted to their original configurations. There are currently about 90 of these historic vessels restored to full sailing trim and competing in regular SKS and IFKS races in Friesland. Wildschut's twenty skûtsjes are a small portion of the 870 iron and steel skûtsjes that were built by some thirty Friesland yards between 1887 and 1933. Of the twenty Wildschut skûtsjes, we have accounted for fourteen survivors, with ten of these now in full sailing trim. Of these, six have the distinction of having been registered as SKS or IFKS racers. Another is the representative skûtsje in the Zuiderzee Museum in Enkhuizen and another is a registered historical sailing ship. The skûtsjes that Wildschut built are held in very high esteem, and we are proud to own one.